VH-MMA DC-3A (42-23731) at Coomalie on the 24/6/2006 during the height of the dry season. Special thanks to Richard Luxton and Ian Madden for giving me access to this site. This airfield was home to No. 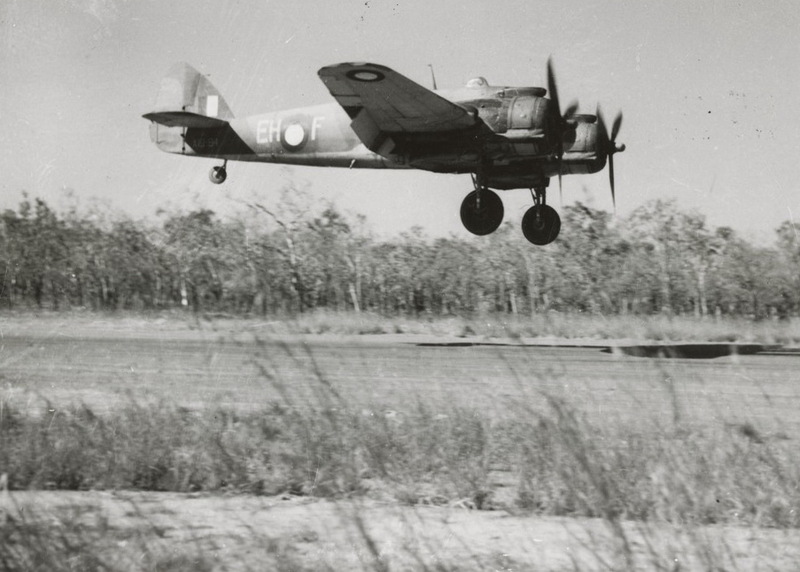 31 Squadron RAAF, No. 87 PR Squadron RAAF and No. 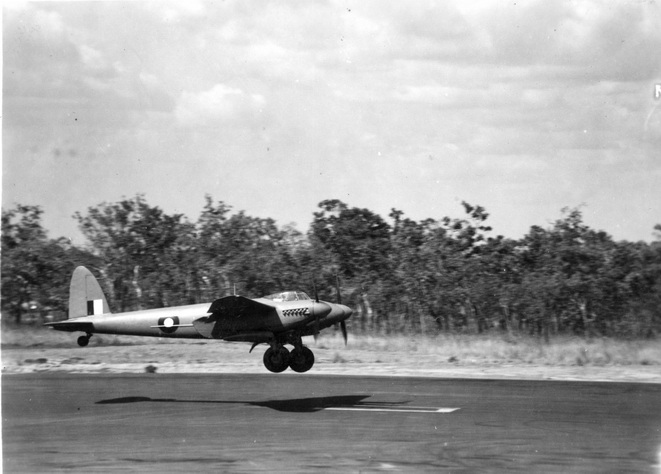 1 PRU Squadron RAAF. 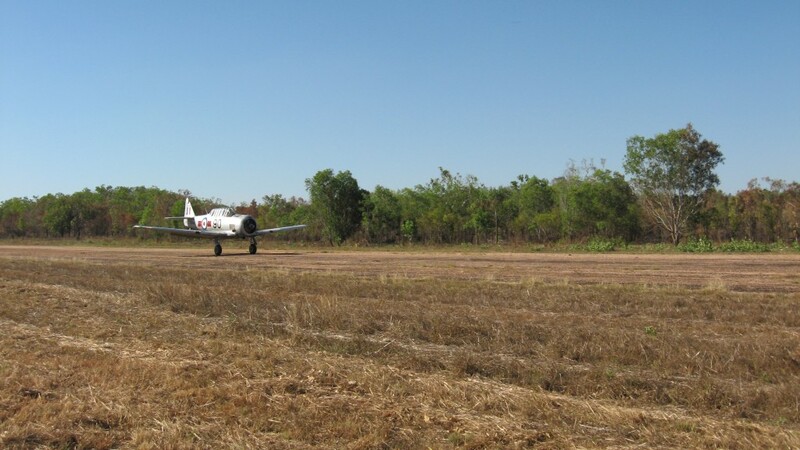 The airfield is located on the Eastern side of the Stuart Highway and is nestled in a valley surrounded by hills to the North and the West with Coomalie creek running to the Southern end of the runway. Taxiways extend mainly to the East, North East and North Western areas of the airfield. The Northern taxiways circle two hills in the vicinity and contain the remnants of hardstands and revetments which would have accommodated the aircraft of the squadrons that operated from the airfield. Anti-Aircraft positions exist on the summit of both of these hills and both had em-placed 40mm and .50 Caliber M2 browning machine guns during the war. The runway itself is still in use to this day, albeit for special occasions. The airfield contains the remains of taxiways, revetments, hardstands, anti-aircraft positions and slit trenches. To the North of the airstrip are the camps of both No 1 PRU and 31 Squadron RAAF. The camps are situated to the East and West of a creek that passes through the area. The creek itself offers natural run off and drainage for both camp sites. 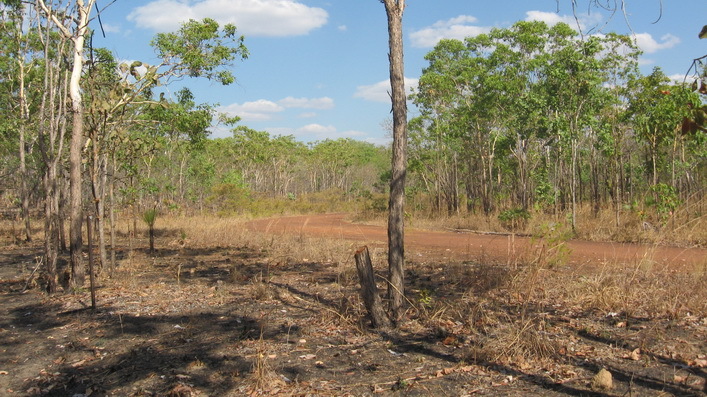 Sadly, portions of the site to the Northern edge of the camp have been destroyed by the construction of the Stuart Highway and turkey bush has taken over the land that has been cleared. Luckily wet weather positions in the hills to the North of this this location are largely untouched and contain many tent terraces. The camp site contains the remains of concrete foundations, vehicle parks, tent terraces, slit trenches, guard positions, telecommunications networks, toilet facilities and a cricket pitch. 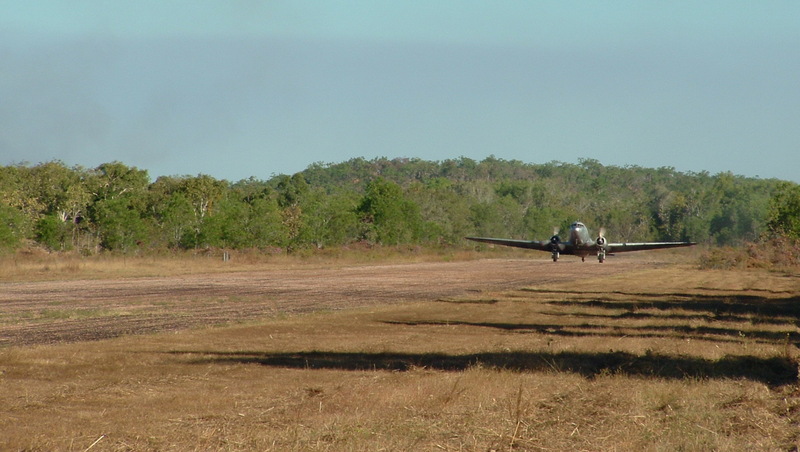 The airstrip in 2000 looking South East. The Eastern taxiway can be seen at the top of the photo. 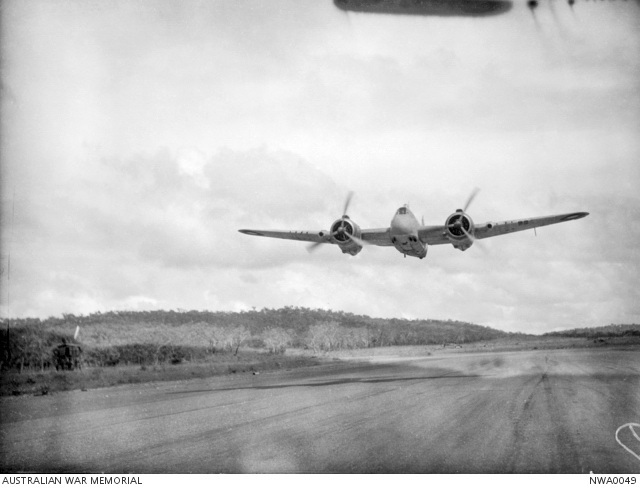 An RAAF Beaufighter flying over the northern end of Coomalie runway heading south. 1943. NWA0049- Copyright expired – public domain. 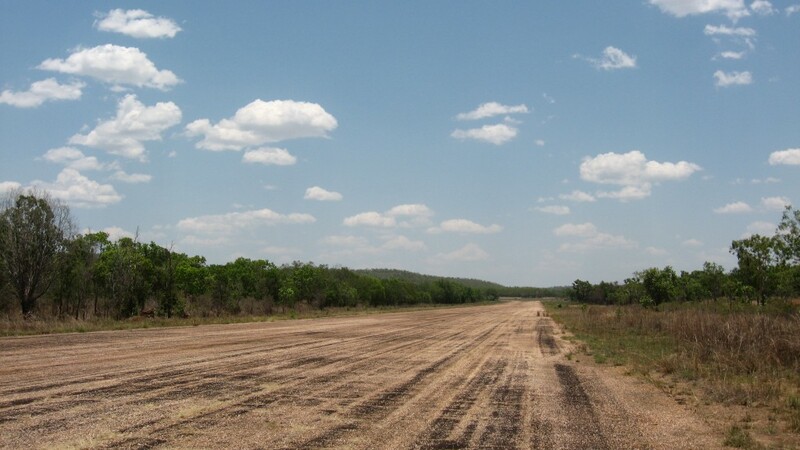 The airstrip looking North in the same direction as the historic photo above. The strip itself is in very good condition for its age. 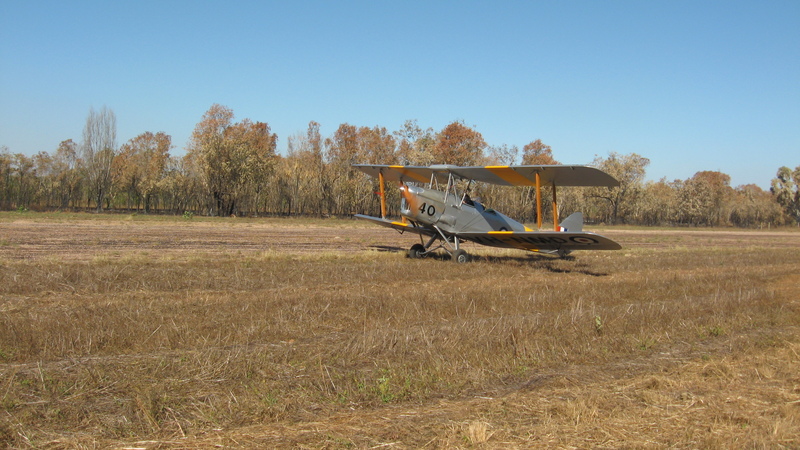 A DH82 Tiger Moth taxing on the grass at Coomalie. 4/7/2009. A T6 Harvard taking off from Coomalie. 4/7/2009. The Eastern taxiway looking North that runs parallel with the airstrip in 2000. This taxiway has since become quite overgrown. This unit was replaced by D Troop of the 225th Light Anti-Aircraft Battery in January 1943. This unit was to remain at Coomalie until August 1943 when they were relieved by A and D Troops of the 149th LAA Battery. The 149th LAA Battery were replaced in January 1944 by B Troop of the 153rd LAA Battery. This unit in turn was replaced in August of 1944 by A Troop of the 232nd LAA Battery who appears to have been the last AA unit based at Coomalie as in December 1944, no references can be found for LAA units at the Field. Scattered around the taxiways and revetments are the remains of these Anti-Aircraft positions which were designed to cover aircraft during landing, taxing and camouflage. The positions are constructed mainly of 44 Gallon drums. Some of the larger positions would have contained 40mm Bofor’s while others would have contained, .50 Caliber, Lewis and Bren Machine guns. An AA position (L4) near the taxiways at the eastern side of the airstrip. This location would have housed twin Lewis machine guns. A 40mm emplacement (L4) constructed from 44 gallon drums filled with earth at the Southern end of the runway. Star pickets located around the circumference of the drums (seen above) suggest that this position would have had camouflage netting draped over the top when not in use. A hardened AA post right on the edge of the North Eastern taxiway with an entrance at the rear. This emplacement is heavily dug in with earth piled up around the circumference. Apart from providing light AA fire, the emplacement would have also provided airmen with a good place to shelter during a strafing attack. L.A.C.’s N. R. Hewitt (Subiaco, W.A.) and R. Nicholls (Bowral, N.S.W.) 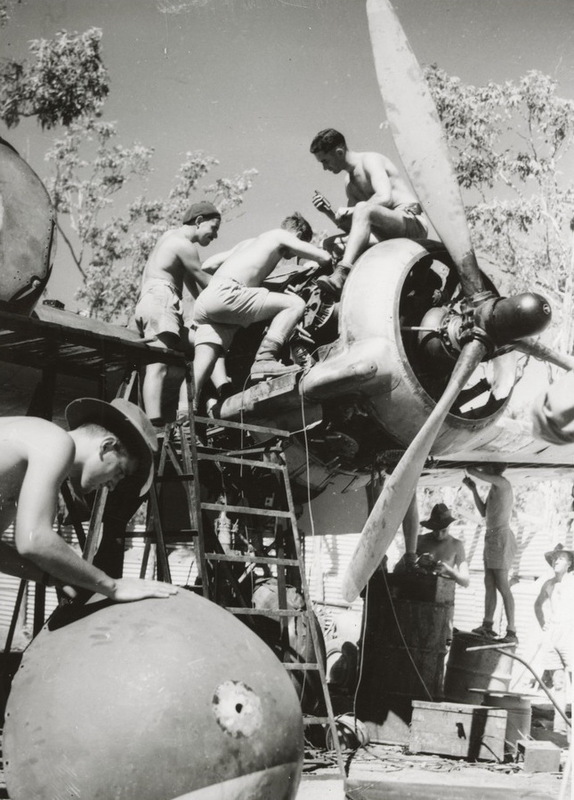 of 31 Squadron RAAF sliding rocket into projector gear preparatory to sortie against Japanese shipping, Coomalie 1944. The same hill (see above photo) from the air taken in 2000. Part of the taxiway going left and right can be seen at the top of the photo. The airstrip (not pictured) is located at top right of the photo. The taxiway completely surrounds the hill and contains many revetments and hardstands. An ammunition locker for a 40mm gun on top of the second hill (L2) near the taxiways. It is constructed form earth filled 44 gallon drums and corrugated iron. This second position is very heavily defended and is ringed by M2 Browning Machine Gun positions also constructed using 44 gallon drums. An M2 Light Anti-Aircraft (L2) position on the second hill. The second hill is close to the runway and this position looks out over its northern end. The same position (L2) in 1943 with fields of fire cleared. 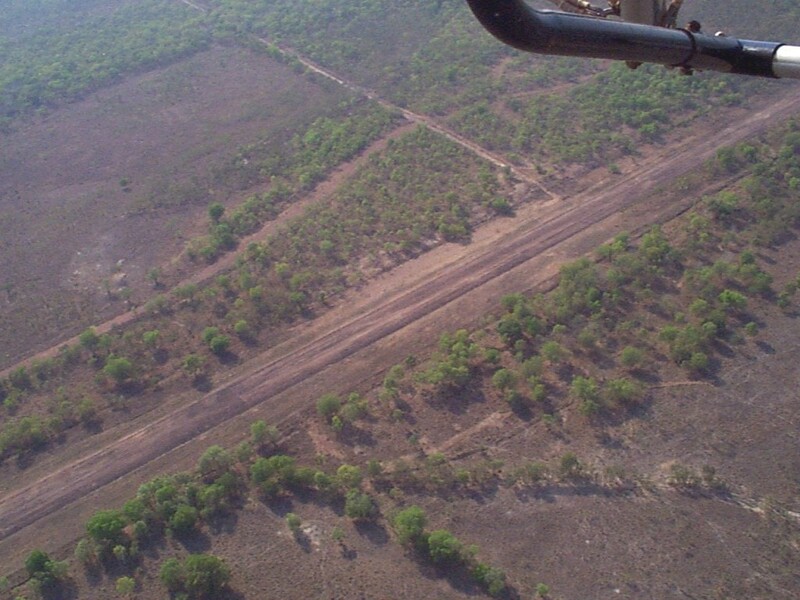 The runway at Coomalie can be clearly seen in this photo as can the ridge to the right. Note the twin M2 Browning machine guns in the center and the muzzles of three SMLE rifles to the left and right. Note also the camouflage netting strung above the position using wire at the ready position. The netting would be wrapped around the gun position when not in use.NWA0027 – Copyright expired – public domain. Camouflage net wire anchors that ring the LAA position above. A large 40mm site directly to the North of the airstrip located on a laterite stone outcrop. With the strafing of Coomalie by Zero’s coming in from the North in March of 1943, this position was expanded and looked to have contained at least 4 ‘Bofors’ guns with many outer light machine gun positions. Indeed this site is one of the largest improvised AA positions seen by the author and covers a very large area. Each emplacement has been well hardened, mainly with the use of 44 gallon drums and with local laterite stone. 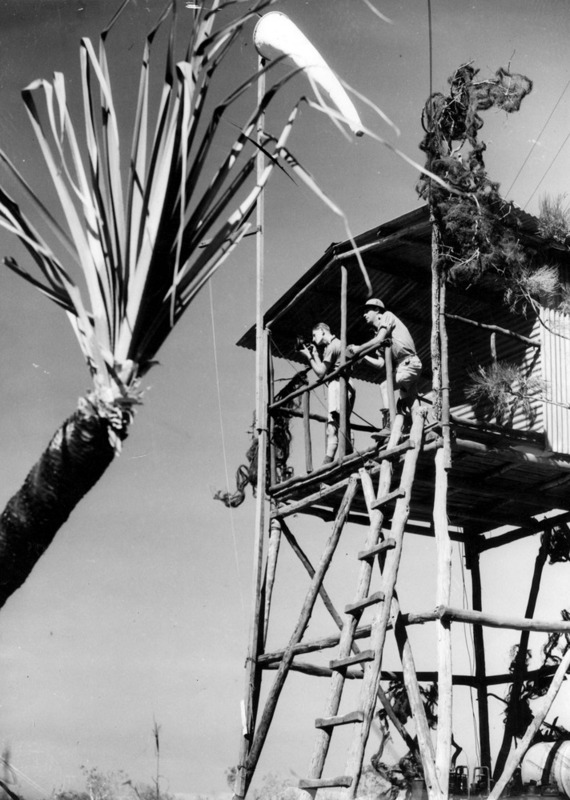 Each position employed camouflage netting as star pickets ring each emplacement. The outer machine gun emplacements would have contained Lewis or Bren machine guns as evidenced by the presence of spent .303 shell casings. Another 40mm gun emplacement in the Northern AA site. One of the outer machine gun positions dug into the local laterite stone outcrop and used for extra protection from low flying aircraft. This site has many slit trenches dotted around its exterior and is testament to the ferocity of the enemy attacks on Coomalie. The 40mm emplacement above is located on side of the ridge-line that overlooks the western part of 31 Squadron base camp. Its purpose was to provide protection for the camp itself and also to provide enfilading fire on enemy aircraft that attempted to attack the airfield from low altitude from the North. The site consists of a hardened AA emplacement, with a similar emplacement for the predictor and a covered magazine store. Considerable effort has been expended to construct the emplacement with the eastern edge of the emplacement having been leveled with the use of local rock. It is one of the most complete AA emplacements of its type in the area. The Eastern edge of the emplacement. Note how it has been leveled with the use of local rock which allowed the 40mm gun to place almost horizontal enfilading fire on any would be attacker flying down the valley as occurred on the 2nd of March 1943. The hardened location for the predictor in a very good condition for its age. Similar sites have been damaged by people searching for spent shell casings with many 44 gallon drums being pushed over and their contents emptied. A magazine store complete with corrugated iron roof. This is located immediately behind the 40mm emplacement area and would have provided quick and easy access to ammunition when required. The emplacement area for the 40mm gun. The predictor and magazine store are at right. Note how the position affords excellent views over the valley beneath the ridge-line. 40mm AA position L6 which overlooks the Western end of the runway at Coomalie. It appeared that there was at least 3 40mm bofors guns sited at this location during the war. A nearby plaque indicated that it was the home of members of the 149th AA Battery for a certain period. The 149th were located at this site between August 1943 and January 1944. 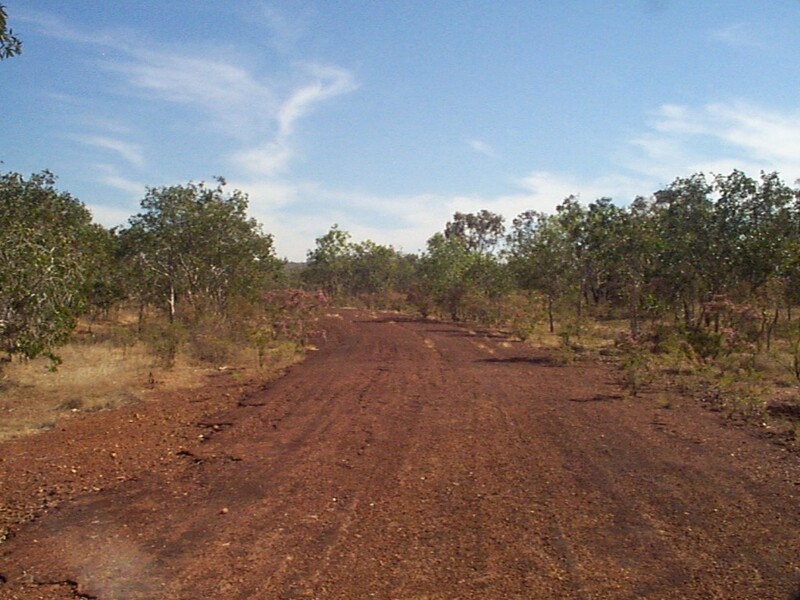 The L6 position is just North of the L5 gun site which is situated at 55.5 mile on the western side of the Stuart highway. A hardened 40mm position of the L6 gun site situated closer to the Northern side of the ridge. The walls of the Western side of emplacement was presumably damaged when the 40mm gun was removed at the end of the war, hence the large gap in the wall at the right of the photo. One of several LMG positions which are located near the 40mm gun emplacements on the Western side of the ridge. These provided protection against low flying aircraft. The L6 gun site also contains a camp area for the gunners. Tent sites (pictured above) are located on the Eastern side of the ridge overlooking the airfield, with the ablution facilities being located on the Western side of the ridge overlooking the 43rd / 16th Battalion camp sites. The author’s father standing on a concrete shower slab on the Western ridge of the L6 camp site. 31 Squadron RAAF Base Camp as pictured in 2000 with the creek at the extreme left. The two buildings seen here were erected over their original locations by the current owner of Coomalie following the war. The camp church building is at right. The area at the top of the photo was cleared for the construction of the Stuart Highway and today is covered in dense turkey bush. No. 31 Squadron RAAF church as reconstructed by the present owner of the site. This is believed to be the Sergeants Mess in the center of the camp area. Officers shower slab and septic at No.31 Squadron RAAF base camp. Believed to be a makeshift camp stove due to the stoking entrance at front. Of peculiar interest at most WW2 camp sites in the NT is insulators screwed into the trees to allow for the stringing of communications wire. More amazing is the fact that a lot of these insulators are still in situ even today. The stringing of these communications cables in local tress served two purposes. 1. Saved on labour. 2. Prevented unnecessary clearing of woodland that would have been spotted from the air and aided in camouflage. The insulators are held in place by large metal screws. Note how the trunk of the tree is trying to grow around them. Most of the tent terraces are located in the hills at the Northern edge of the campsite. These were the homes for many of the pilots and ground staff of 31 Squadron RAAF. All are constructed out of local rock and most have slit trenches right beside them. Tent terrace on the side of the Northern hills. These “thunder boxes” are located in the hills to the North of the Airstrip and served the 31 Squadron RAAF camp. 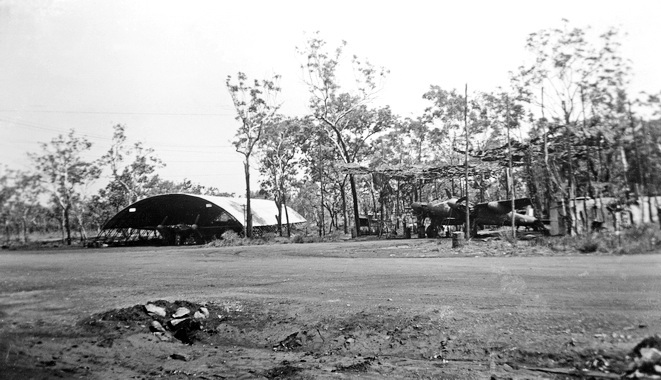 A good wartime photo of these latrines at Coomalie illustrating how they were setup with bush timber poles, a corrugated iron roof and hessian for the walls. AWMP00296.072 - Copyright expired – public domain. 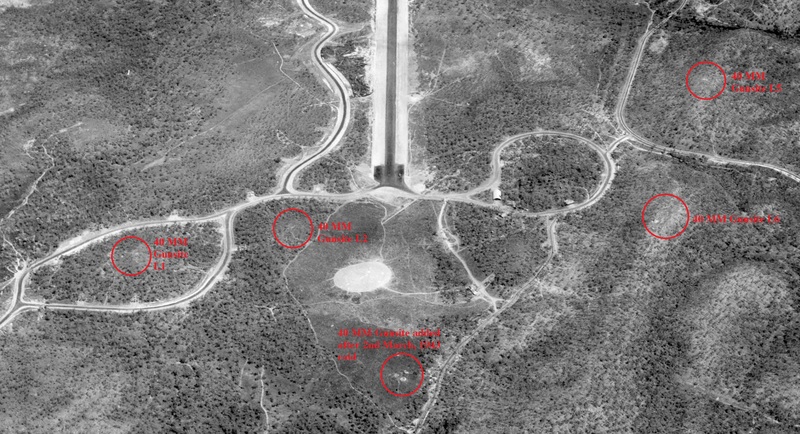 No 1 Photo Reconnaissance Unit Camp area is located directly 2km North of the end of the runway and is situated on the side of a low ridge that extends northwards towards 51 mile. It contains many concrete slabs and tent sites which extend upwards onto the ridge for a considerable distance. One of the main building foundations located near the gully at No.1 PRU camp site. A very elaborate paved tent site situated half way up the ridge in the No.1 PRU camp area. Another paved tent site situated on top of the ridge line. This tent site can just be seen in the historical photo below at right. Slit trenches at the site can be found almost everywhere, but the best preserved ones are located near the Eastern Taxiways. These would have provided ground crew and aircrew with shelter should a raid occur while working on their aircraft. A slit trench located near the remains of a revetment on the Eastern taxiway.